I have recently become obsessed with maps of different kinds. Couple this with the recent discovery of a neat trick you can do with Youtube clips,* and there you have it. *If you want only this and can’t be bothered with the rest of it, go directly to step 10. Check you have a working device for displaying the Youtube clip. If no internet connection is available, download the clip beforehand using www.keepvid.com or similar. 1. Chat to your students about their favourite subjects at school. Find out if anyone liked geography. I did – and a love of maps was at the heart of it. 2. Flash up the first of the two images below and ask the students if this map seems right or not. It should do. Then display the second one. Is anyone familiar with it? Fewer people will be, most likely. If anyone does know what it is, ask them to keep quiet about it for now. Elicit a couple of obvious differences that the students have spotted. 3. Explain that they are going to look for more differences. Display the images again, for a bit longer this time, then conceal them. Ss should discuss in pairs what the differences were. Listen out for how they frame their comparisons for feedback. 4. Find out if anyone knows anything about the origins of these maps. If not, tell the Ss that the first map is based on the Mercator projection, and the second the Peters projection. Say that Mercator and Peters are people’s names – elicit that their field is cartography and that they are cartographers. 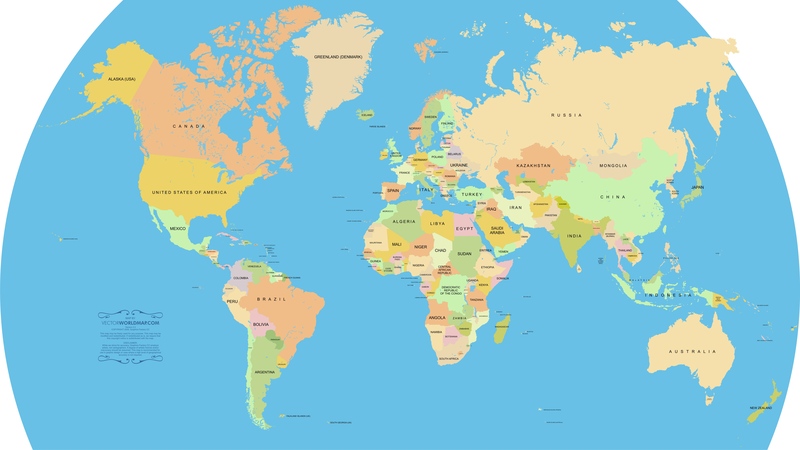 Ask the Ss which map they think is older (the Mercator one), and which purports to show the nations in their true size and proportion (the Peters). Which one were they accustomed to at school? (The Mercator, I imagine). What does the group propose? What is the reaction of Cregg and Lyman? They propose that the Peters Projection replace the Mercator in schools in America. They also propose turning the map upside down. Cregg and Lyman’s reactions range from surprised and intrigued to disinterested, astounded and finally ‘freaked out’. Josh Lyman can’t believe that Germany ‘isn’t where we think it is’. 8. Play the clip again and allow the Ss time to check their notes together in pairs before taking feedback. Check any potentially tricky vocab (I’ve underlined some of the potentially more challenging words below – but much of this will vary from class to class, and L1 to L1). Also, encourage them to be as precise as possible in their comparisons, depending on the data that they have. The Mercator map was designed in 1569 to help European sailors navigate. The poles are enlarged to create straight lines which make it easier to cross oceans, but this distorts the relative size of nations. South America (6.9m sq miles) is really double the size of Europe (3.8m sq miles), but looks smaller on the Mercator map. Alaska appears 3 times the size of Mexico on the Mercator, but Mexico’s actually larger by 0.1m sq mile. Finally, Germany is really in the northernmost quarter of the globe, but in the Mercator map appears in the middle. 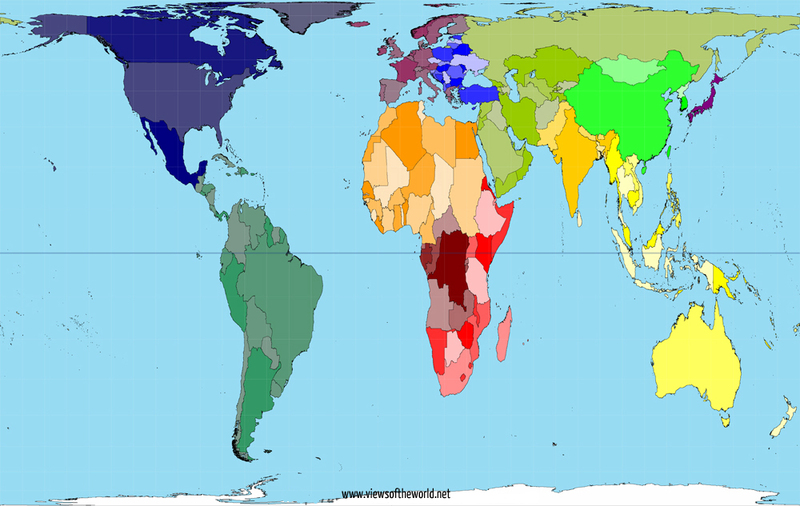 The Mercator map has created “an ethnic bias against the third world”. Size is equated with power, so third world countries which are misrepresented as small on the map will be valued less. Also, having the northern hemisphere on the top, and the southern on the bottom, reinforces “top and bottom attitudes” – that is, the importance of the northern hemisphere is exaggerated. 9. Ask the class to discuss, in pairs or groups of three, whether or not they would accept either one of the proposals, and to justify their decision. Take some ideas after a few minutes. Do they accept the connection between maps and social equality? Anyway, the problem is, of course, that Youtube isn’t (yet) very good at transcribing the subtitles. In fact, it made a number of inexplicable errors. Can the students figure out what the problems are? Hand them the script below and get them to start underlining and discussing what’s wrong. 11. Once the students have done this, play the clip back one last time (perhaps muting the screen to focus them on the audio only) to check their ideas. Pause after each error to confirm what it should be (answers are in the second part of the document above). There may be parts that students have corrected unnecessarily. ‘Sorry to be late’ may be seen as a US English version of ‘Sorry I’m late’ or ‘Sorry for being late’. ‘Course’ has no ‘of’ to introduce it – this strikes me as a pretty common example of ellipsis. And ‘merry men’ is not an error, but rather a humorous reference to Robin Hood. Aside from these, you might want to point out that Dr Fallow’s responses to introductions (‘Course you are’ and ‘Indeed you are’) are perhaps not the most high frequency phrases used in such a situation. 12. Now ask the students to consider why the errors were made. What listening difficulties does the caption creator have? Discuss the first example below to demonstrate. Direct them to consider the other examples below if they struggle to come up with more ideas. Highlight on the board how, just like ‘want to’ becomes ‘wanna’, ‘Give me’ can become ‘gimme’ in informal written English. 14. Get the Ss to read through the corrected dialogue in pairs or groups (Ss can jump between roles, or simplify multiple roles into one, if there are not enough in each group to cover all the parts). Listen out for, and feed back on, how natural their pronunciation was, with a particular focus on connected speech. 15. Finally, get the Ss to improvise the dialogue without the aid of the tapescript. Feedback again on any errors or pronunciation points they might need more focus on. Just to let you know I did this lesson yesterday. It went really well. The students were really interested in the subject and the maps themselves. It produced a lot of good language and overall, it lasted about one and half hours. I pretty much followed your plan to the word. I found the comparison activity didn’t work so well and perhaps needed a bit more guidance and scaffolding. The sts were so interested in the maps individually that it was hard to get them to actual compare. Then again it might just have been my students. All in all another great lesson. Hope the feedback is useful. Many thanks for your feedback, it’s really appreciated! I’m glad the lesson went well. Maybe for the comparisons stage we could recommend setting a goal for the activity – telling the Ss, for example, that they need to find three differences between the maps and to describe these as accurately as possible, after describing one difference with the whole class. Maybe they need the maps in fron of them for this, rather than trying to do it from memory. My Ss found this part quite challenging too! Did your Ss find it useful to read the dialogue back or did you do something else to follow up on the pron work? Anyway, it’s always great to hear how these things go for other people, so thanks again for taking the time to comment. Sorry if that’s the case – George, can you check that out?